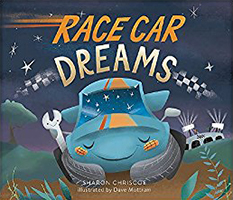 Sharon Chriscoe may not vroom around a race track, but she does zip and zoom around in a bread truck with her husband, Ricky. Fueled with fresh bread, snacks, and writing tools, Sharon has made this her mobile office! She and her husband live in Pilot Mountain, North Carolina. They have three children and an assortment of dogs, cats, bunnies and occasionally a groundhog. Sharon is also the author of The Sparrow and the Trees.